It will be variably cloudy tonight and tomorrow, with just a slight chance of a shower. Highs tomorrow will be in the upper 50’s to mid 60’s. Monday, it now appears that the Nor’easter will develop further east, giving us just a chance for some showers. Highs will be in the 60’s. Tuesday is then looking variably cloudy with a chance of a shower at night as a cold front approaches our area. Highs will be in the upper 60’s to mid 70’s. Wednesday will then be nice with highs from the low to mid 60’s in Northeastern PA to the upper 60’s to low 70’s in Central and Northeastern NJ, NYC, and on Long Island. Thursday clouds will increase with a chance of showers developing in the afternoon or at night as a disturbance and cold front approach our area. Highs will be in the upper 50’s to mid 60’s. Friday there will be a chance of showers as a disturbance and cold front pass through our area. Highs will be in the upper 50’s to mid 60’s. Next Saturday, April 27th, through the following Saturday, May 4th, it is then looking as if we will finally have an extended period with some nice weather. Highs will be in the mid 50’s to low 60’s next Saturday through Monday, and the mid 60’s to low 70’s next Tuesday through Friday. 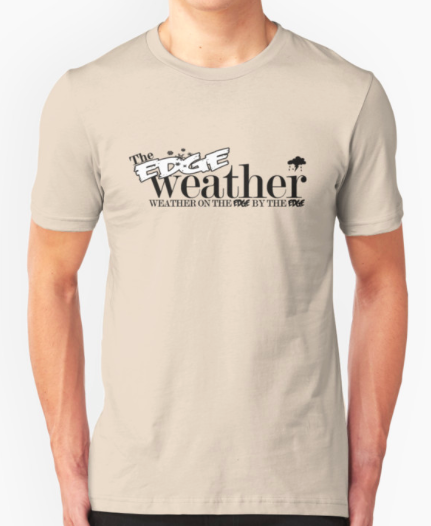 Follow this blog @TheEdgeWeather on Twitter or Facebook. The rain will end this morning and then there will be just a slight chance of a shower this afternoon. Highs will be in the 60’s in the morning, with some low 70’s in East Central PA, dropping in areas near the coast in the afternoon. Tomorrow will be variably cloudy with a slight chance of a shower as a couple of weak disturbances approach our area. Highs will be in the upper 50’s to low 60’s in Northeastern PA, along the NJ Coast, and on Long Island, to the mid 60’s to low 70’s in Central NJ. Monday will be cloudy with rain likely as two approaching weak disturbances may combine to form a Nor’easter. The rain could be heavy at times in East Central and Northeastern NJ, NYC, in Rockland, Westchester and Putnam Counties in NY, on Western and Central Long Island, and in Fairfield County, CT, with 1-2 inches of rainfall possible in parts of these areas. Highs will range from the mid to upper 50’s in Central NJ to the mid 60’s in far northern Northeast PA.
Tuesday will be variably cloudy with a chance of a shower early in the morning, and then again in the afternoon, and especially at night, as a cold front approaches our area. Highs will range from the mid to upper 60’s along the coast to the mid 70’s in East Central PA and in inland Central and Northern NJ. Wednesday and Thursday will be variably cloudy with a chance of showers as the approaching cold front may stall, becoming a stationary front. Highs will range from the mid to upper 60’s in Northern Northeast PA to the mid to upper 70’s in Central NJ Wednesday, to the upper 50’s to mid 60’s Thursday. Friday will be cloudy with a chance of rain, as a disturbance may develop along the stationary front. Highs will be in the 60’s. Next Saturday, April 27th, through the following Friday, May 3rd, it is looking hopeful that we will have an extended period of nice weather as the stationary front should break down. Highs will be in the upper 50’s to mid 60’s next Saturday, the mid 50’s to low 60’s next Sunday, the mid 50’s to low 60’s next Sunday, and the upper 50’s to mid 60’s next Monday through Friday. There will be a chance of showers and possibly a thunderstorm tonight into tomorrow morning as a strong disturbance and cold front pass through our area. The rain could be heavy at times in some places late tonight into tomorrow morning. Rainfall amounts will generally range from a half of an inch to an inch and a half throughout our area, except for possibly higher amounts in parts of Northeastern PA and especially in Southeastern Fairfield County, CT. It will also be windy, with gusts of up to 50 mph possible in some locations. It will then be variably cloudy with a chance of a shower. Highs will be in the 60’s, and possibly some low 70’s in East Central PA.
Easter Sunday will then be variably cloudy with a slight chance of a shower. Highs will be in the upper 50’s and 60’s. Monday, a disturbance approaching from the west may combine with a disturbance off the coast to form a Nor’easter that would bring us the potential for some rain on Monday that could be heavy in parts of our area. Highs will be in the 50’s to low 60’s. Tuesday will then be variably cloudy with a chance of showers at night as a disturbance passes to our north. Highs will be in the upper 60’s to mid 70’s. Wednesday is then looking nice with highs in the upper 50’s and 60’s. Thursday, clouds will increase, with a chance of rain developing at night, as a disturbance approaches from the west. Highs will be in the mid 50’s to low 60’s. Next Friday, April 26th, there will be a chance of showers as a disturbance passes through our area. Highs will be in the 60’s. Next Saturday, April 27th, through next Monday, April 29th, are then looking nice with highs in the 60’s next Saturday and the upper 50’s to mid 60’s next Sunday and Monday. Next Tuesday, April 30th, there will be a chance of showers as a disturbance and cold front pass through our area. Highs will be in the 60’s. Next Wednesday, May 1st, and next Thursday, May 2nd, are then looking nice with highs in the low to mid 60’s. It will be cloudy with a chance of a shower this morning, then showers will be likely this afternoon and tonight as a strong cold front and disturbance approach our area. It will become windy with gusts up to 50 mph possible. Highs will be in the 60’s on Long Island and in Fairfield County, CT, in the mid to upper 60’s in Northeastern PA, and in the low to mid 70’s in East Central PA, Central and Northern NJ, and in Southeastern NY State. Tomorrow showers will be likely, and possibly a thunderstorm. The rain could be heavy at times in parts of our area, with 1-3 inches of rain possible in some locations. There could be flooding in any locations that receive the heavy rainfall. It will be windy, with gusts of up to 50 mph possible in the morning. Then there will be a chance of a shower in the afternoon. Highs will be in the 60’s, with some low 70’s possible in East Central PA.
Monday a disturbance may pass through our area. This will bring us a chance of showers with highs in the upper 50’s to mid 60’s. Tuesday will then likely be variably cloudy with a chance of a shower. Highs will be in the upper 60’s to mid 70’s. Wednesday through next Thursday, May 2nd, are then looking nice with highs in the upper 50’s to mid 60’s Wednesday and Thursday, the mid 60’s to low 70’s next Friday, the 60’s next Saturday, and the upper 50’s to mid 60’s next Sunday through next Thursday. Saturday morning there will be a chance of showers or thunderstorms, and they could be heavy at times as the cold front passes through our area. Rainfall amounts will range from a half of an inch to 2.5 inches throughout our area, with the highest amounts most likely to fall in parts of Northeastern PA and in Fairfield County, CT. Areas that receive the heavy rainfall amounts will have some flooding. There will then be a chance of a shower in the afternoon. It will also be windy, with gusts up to 55 mph possible, especially in the morning. Highs will be in the 60’s. Easter Sunday will then be variably cloudy with a chance of a shower as a disturbance may develop in our area. Highs will be in the 60’s. Monday will then be variably cloudy, with a chance of showers, as the disturbance may pass through our area. Highs will be in the upper 50’s to mid 60’s. Tuesday is then looking variably cloudy with a chance for showers as a weak disturbance and cold front pass through our area. Highs will be in the mid 60’s to mid 70’s. Wednesday, through next Tuesday, April 30th, are then looking nice with highs in the upper 50’s to mid 60’s Wednesday, the mid 50’s to low 60’s next Thursday, the 60’s next Friday and Saturday, the mid 60’s to low 70’s next Sunday, the mid 60’s to low 70’s Monday, and the 60’s next Tuesday. Next Wednesday, May 1st, is then looking variably cloudy with a chance of a shower as a cold front passes through our area. Highs will be in the low to mid 60’s. Today will be variably cloudy with a chance of a shower. Highs will range from the upper 50’s to low 60’s in Southeastern NY state, Fairfield County, CT, and on Long Island, the low to mid 60’s in Northeastern NJ and NYC, the mid 60’s to low 70’s in Northeastern PA, and East Central and Northwestern NJ, and the mid 70’s in East Central PA and West Central NJ. Tomorrow clouds will increase, with a chance of a shower developing in the morning, then showers will be likely in the afternoon and evening, as a strong disturbance and cold front approach from the west. It will become windy with gusts up to 45 mph possible. Highs will be in the 60’s on Long Island, the mid 60’s to low 70’s in Northeastern PA and Fairfield County, CT, the low to mid 70’s in East Central PA, East Central and Northern NJ, NYC, and Southeastern NY State, and in the mid 70’s in West Central NJ. Saturday, showers will be likely, and possibly a thunderstorm early in the morning, then it will be partly cloudy with a chance of a shower, especially on Long Island, as the cold front and disturbance pass through our area. It will also be windy, especially in the morning, with gusts up to 50 mph possible. Rainfall amounts will generally be 1-2 inches throughout our area could cause some flooding, especially in Southeastern Fairfield County, CT. Highs will be in the mid 50’s to low 60’s on Long Island, the upper 50’s to low 60’s in Fairfield County, CT, the upper 50’s to mid 60’s in NYC and Westchester County, NY, the low to mid 60’s in East Central NJ, NYC, and in Rockland and Putnam counties in Southeastern NY State, the mid to upper 60’s in Northeastern NJ, the upper 60’s to low 70’s in Northeastern PA, Northwestern NJ, and West Central NJ, and in the low to mid 70’s in East Central PA.
Easter Sunday will be variably cloudy with a chance of showers, especially at night, as a disturbance approaches our area. Highs will be in the 60’s to low 70’s. Monday will be variably cloudy with a chance of showers as a disturbance passes through our area. Highs will be in the upper 50’s to mid 60’s. Tuesday will be variably cloudy with a chance of a shower in the afternoon or at night as a cold front approaches from the north. Highs will be in the mid 60’s to mid 70’s. Wednesday will be variably cloudy with a chance of showers at night as the cold front may become a stationary front and then a disturbance may develop along the front. Highs will be in the low to mid 60’s. Next Thursday, April 25th, is then looking variably cloudy with a chance of showers, especially in the morning, as a disturbance may be departing our area. Highs will be in the upper 50’s to mid 60’s. Next Friday, April 26th, is currently looks nice highs in the 60’s. Next Saturday, April 27th, and next Sunday, April 28th, are looking variably cloudy with a chance of a shower as a disturbance passes through our area. Highs will be in the 60’s. Next Monday, April 29th, and next Tuesday, April 30th, are then looking nice with highs in the low to mid 60’s next Monday and the upper 50’s to mid 60’s next Tuesday. Next Wednesday is then looking variably cloudy with a chance of a shower as a disturbance may pass through our area. Highs will be in the mid 50’s to low 60’s.